Well 2016 is just over a week old and already we’re hard at work. 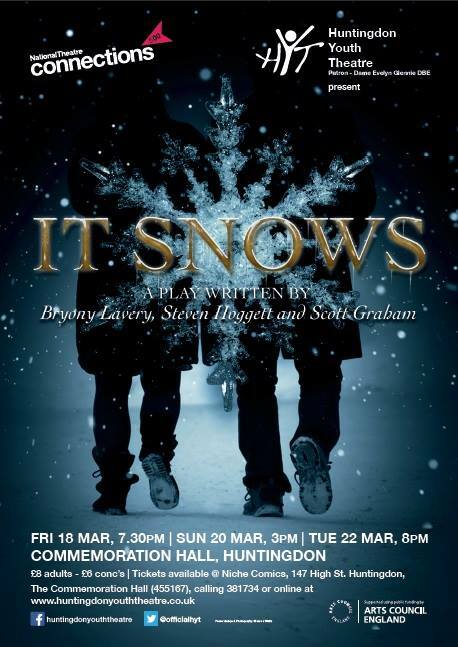 We’ve been working on our National Theatre Connections production of “It Snows” with director John McCusker in and out of meetings and working hard on creating the dynamics between the various characters we will introduce you to in March. Tickets are now available by clicking on the “Buy tickets” tab on the top of this very page! Not only that but we’re also under way as we prepare for our third visit to the courtroom following our sold out performances of The Witches of Warboys and The Trial of Joshua Slade. This years show tells the story of “The Murder at the Meads” in Broughton relating to a case from the interwar years. Once again we are working with the Mayor of Huntingdons Charities and tickets for this play are now available by following this link and booking your date in court. It’s going to be a busy year, it’s great to be back on the stage rehearsing after the Christmas break!